The 11th Annual Irish-American Crossroads Festival of 2014 delivered a feast of cultural offerings to San Francisco Bay Area audiences including the shared history of African- & Irish-Americans as presented by master musicologist and historian, Mick Moloney and dance historian, Lenwood Sloan. As well, the Festival featured a film premiere, “Men At Lunch”, the history of Hetch Hetchy’s Irish legacy, the unmatched detective fiction writer Peter Quinn, as well as legendary accordionist Paddy O’Brien. Join us for a concert with the award-winning two-row button accordionist, Paddy O’Brien, a much-admired virtuoso with a career spanning nearly four decades. O’Brien, a practioner of sean nós, or the old style of traditional music, is legendary for his musicianship, his compositions and for the vast archive of Irish tunes that he has committed to memory – over one thousand tunes! 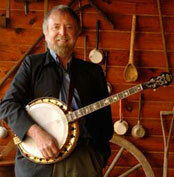 In 2012, Paddy was named “Irish Traditional Composer of the Year”. He will be joined by Richard Mandel on guitar. Books, CDs and tune collections will be available for sale. Paddy O’Brien‘s memoir, The Road From Castlebarnagh — Growing Up In Irish Music: A Memoir, offers a glimpse into Irish life more than half a century ago. Paddy grew up in a small thatched house without running water or electricity, at a time when the social life in the Irish countryside was centered around the hearth fire, music, and stories. In his book, Paddy takes on the role of traditional storyteller, or shanachie, offering tales of his first musical instrument, house dances, learning tunes off the radio, thatching the house with his father, ringing the pig, the boys’ National School, and the annual ritual of turf cutting. Growing up in that traditional culture built on tunes and stories instilled in Paddy a deep need for expression over technical perfection, and for music that possessed something known as the draíocht—the Gaelic word for spiritual power or soul. Paddy will read from his memoir and talk about his legendary life of music, inviting Q&A from the audience. Books, CDs and tune collections will be available for sale. 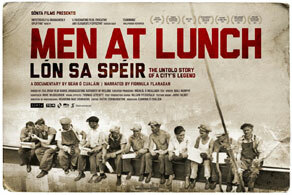 Crossroads is honored to host the Northern California Film Premiere of the remarkable documentary, Men at Lunch. In this film, director Seán Ó Cualáin tells the story of Lunch atop a Skyscraper, the iconic photograph taken during the construction of Rockefeller Center that depicts eleven workmen taking their lunch break while casually perched along a steel girder. For 80 years, the identity of the eleven men – and the photographer that immortalized them – remained a mystery: their stories, lost in time, subsumed by the fame of the image itself. But then, at the start of the 21st century, the photograph finally began to give up some of its secrets. Part homage, part investigation, Men at Lunch is the sublime tale of an American icon, an unprecedented race to the sky and the immigrant workers that built New York. Q & A will follow the film with the producer, Eamonn Ó Cualáinand novelist and chronicler of New York City, Peter Quinn, who is featured in the film. featuring novelist Peter Quinn and a reception with Roche Winery & Vineyards and Live Music (party location: in San Francisco). You are cordially invited to an unforgettable night of conversation, storytelling, and live music. Award-winning novelist, political historian and foremost chronicler of New York City, Peter Quinn will regale party-goers with his insights into Irish-America. Courtesy of Roche Winery & Vineyards (of Sonoma), attendees will have a chance to taste premium Roche Wines in concert with food pairings. Beautiful classical jazz music, steeped with Brazilian rhythms, will be provided by the celebrated guitarist, Ricardo Peixoto. This fun and festive evening will take place in an elegant and gracious home in the St. Francis Woods neighborhood of San Francisco. Guests will enjoy sweeping, beautiful views of the city. The proceeds from this special night will directly support the ongoing work of the Crossroads Irish-American Festival and the Irish Oral History Archive of the San Francisco Bay Area, a project of Crossroads. Please come and invite your friends! Space is limited. Join us with the kids to enjoy this ever-popular Festival offering! 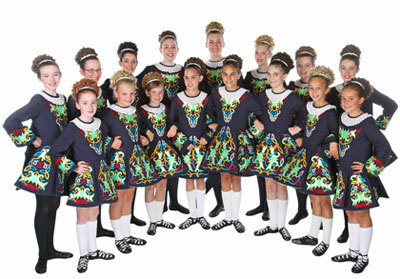 Dancers from the Brosnan School of Irish Dance will delight audiences with jigs, reels, and other high-kicking dance steps. Also, children of all ages will enjoy a lively performance of Irish traditional tunes by fiddle, accordion and guitar trio, Kevin Bernhagen, Lisa Winch and Richard Mandel. Award-winning novelist, political historian and foremost chronicler of New York City, Peter Quinn will join in conversation with Crossroads’ Margaret McPeake at the Koret Auditorium of the Main San Francisco Public Library. Quinn has just released Dry Bones, the third in the Fintan Dunne trilogy of detective novels. In Dry Bones, Dunne is recruited to the Office of Strategic Services – the forerunner to the CIA – by pal and Irish American legend Col. William “Wild Bill” Donovan. It is 1945 and World War II is finally drawing to a close. Dunne and his colleagues must go behind enemy lines to rescue a team of fellow OSS officers. The mission leads Dunne to numerous revelations, the consequences of which reverberate for a decade afterwards. In Dry Bones, we see Dunne not only on the front lines, but also thrust into the prosperous 1950s, where our cantankerous hero has trouble fitting in. The trilogy also includes, The Man Who Never Returned and The Hour Of The Cat. Also, Quinn and McPeake will be discussing Banished Children Of Eve. Published 20 years ago, Quinn won the American Book Award for this landmark historical fiction about New York City during the Civil War draft riots. A special thanks to the ‘Friends of the San Francisco Public Library’ for their support of events at the SFPL. A special thanks to Ranger Pipelines, Inc. of San Francisco for their underwriting sponsorship of events at the SFPL. Join us for an alternative St. Patrick’s Day gathering honoring the legacy of Irish-American poetry with new Sonoma County Poet Laureate, Katherine Hastings, who will read from her just-published volume, Nighthawks (Spuyten Duyvil, NYC, 2014). In addition to Nighthawks, Katherine is the author of Cloud Fire (Spuyten Duyvil, NYC, 2012) as well as several chapbooks. Her work has appeared in dozens of literary journals and anthologies as well as The Book of Forms – a Handbook of Poetics (Lewis PutnamTurco, ed., University of New England Press, 2012). She is executive director of the non-profit WordTemple, curator of the WordTemple Poetry Series and host of WordTemple on NPR affiliate KRCB FM. Hastings is serving as poet laureate of Sonoma County for the years 2014 – 2016. For more information, go to www.wordtemple.com. Irish soda bread and other tasty delights will be served. This is a free event. A special thanks to John Campbell’s Irish Bakery, 5625 Geary Blvd. @ 20th Avenue, San Francisco for the generous donation of Irish Soda Bread for this event. Drawing from the traditional background and diaspora of two oppressed peoples, enslaved Africans and indentured Irish immigrants, Mick Moloney and Lenwood Sloan explore the curious and tumultuous journey of the banjo, fiddle, jig, joke and jump, dance, riddle, rhyme, song, shuffle and clog. Their cultural dialogue begins at the departure point of two diverse cultures in the 18th century; their early 19th century encounter in the Caribbean, amalgamation in New Orleans’ Congo Square, entry into America along the Mississippi after 1803, the 1840’s escape to Appalachia, and their arrival and confrontation in America’s urban cities by the beginning of the Civil War. Presenters demonstrate the collision of African and Irish cultures as they encounter each other on the American stage through examples from pre and post war Minstrel era, Jim Crow era burlesque and Vaudeville, turn of century Tin Pan Alley, and film and Broadway between the two world wars. The evening includes enlightened dialogue, spirited exchange, compelling imagery, and a rollicking music and dance demonstration. Co-sponsored by the University of San Francisco College of Arts and Sciences, African American Studies Program at the University of San Francisco, the African American Arts & Culture Complex, and the Museum of the African Diaspora (MoAD). Crossroads is pleased to once again present author and educator, Margaret Cooley, as she teaches this popular facilitated workshop on the research and composition of family histories. Sometimes all we have left of our ancestors is a photograph, a marriage record or a Mass card. Margaret will give a talk and teach a workshop on how she began without any records, stories or photographs and found enough information to recreate a family story and write a book, The McQueeneys: From Ireland to America. Participants may bring a family photograph or record and will have an opportunity to access ancestry records at the workshop. Margaret will assist participants in using vital records and photographs to begin to tell their family stories and make their own books. 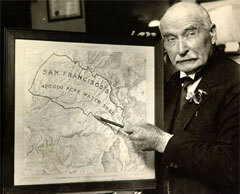 Michael O’Shaughnessy was an Irish civil engineer who became city engineer for the city of San Francisco during the first part of the twentieth century and developed the Hetch Hetchy water system. 2014 marks the 80th anniversary of the arrival of water from Hetch Hetchy in San Francisco. Crossroads is proud to partner with the California Historical Society to present this roundtable discussion facilitated by Elizabeth Creely, featuring Robert Cherny, Joshua Milstein and Catherine Powell. Robert Cherny, professor emeritus at San Francisco State University, specializes in American political history from the Civil War to World War II and in the history of California. He is the author of three books on U.S. politics, 1865-1925, and of more than thirty published essays in journals and anthologies, most of which deal with the history of politics and labor in California and the West. Joshua Milstein has been working as a deputy City attorney and involved with water matters for the San Francisco Public Utilities Commission since 1985. Catherine Powell is the Director of the Labor Archives and Research Center at San Francisco State University. Catherine is co-chair of the Labor Archives Roundtable of the Society of American Archivists, coordinator of the Bay Area Labor History Workshop and a board member of the Fund for Labor Culture and History. All accomplished young musicians in their own right, FullSet create a stunning and unique sound that is full of energy and innovation, whilst all the time remaining true to their traditional roots. 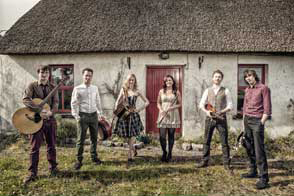 In recent years this young group has received much critical acclaim, even being compared to super groups such as Danú & Altan by respected Irish Music Magazine. FullSet are set to thrill audiences throughout the world. Following the tremendous success of their debut album “Notes At Liberty”, FullSet are quickly becoming one of the most well known bands in the Irish music scene today. In 2012 FullSet were honored to receive “Best New Group Award” from the well respected Irish American News as well as “Best New Comer” in Bill Margeson’s Live Ireland Awards. Crossroads is pleased to join with The Plough & Stars to present a concert featuring a memorable night of terrific music by FullSet. Crossroads offers our fourth annual event honoring the life histories of participants in the Irish Oral History Archive of the San Francisco Bay Area. This afternoon gathering will highlight the individual stories of several Oral History Archive participants including Sheila Brosnan, Renee Gibbons, John Jones and JJ Whelan. Bring the whole family! A special thanks to the Irish Government’s Emigrant Support Programme for its generous support of the Irish Oral History Archive of the San Francisco Bay Area.